Transition your skills and experience in the home services industry into an owner/operator of your own insulation franchise. 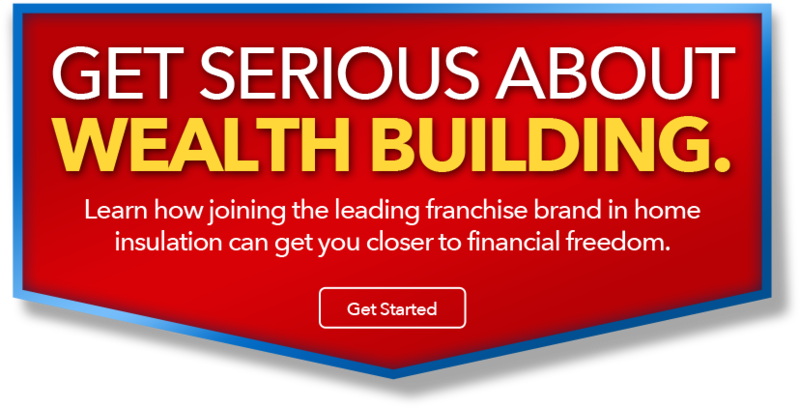 Get our franchise guide to learn how easy it is to be your own boss. Take advantage of low market competition and position yourself for growth through multi-unit franchise ownership. Do YOU have what it takes to build a multi-million dollar insulation business in your community? We don’t require insulation or service industry experience. Our best operators have sales and management experience and know how to manage people effectively. Being a USA Insulation franchise owner requires you to work closely with your team to build skills, leadership and strengthen their commitment to customer satisfaction. Our proven model for success has been honed for over three decades. Are you ready to put your skills, experience, and drive to work building a future? Our franchise owners all understand the opportunity USA Insulation offers, it is their ability to seize the opportunity and make it work for them that requires vision. The USA Insulation business model is extremely strong. Those who are driven, follow our system, and leverage our resources tend to be the most successful. Launching a new business is always challenging. USA Insulation’s proven business model and our support systems enable new owners to launch their business with confidence. Learn how one smart franchise operator has build his USA Insulation business into an $8 million dollar, multi-unit operation across Northern Ohio. Over 32 years ago, Jeff Pitrone (USA Insulation founder) took me under his wing, shared his enthusiasm for the insulation business and made sure I understood how to keep our customers happy. Although I never achieved a college degree, I made up for it with real business experience and determination. What motivated me the most was the idea of saving hardworking Americans money in utilities and having the very best product to achieve the goal. After helping the original USA Insulation business grow and refine the business processes, I expanded the business and opened in Columbus, Ohio in 1989. Today, I operate the most successful USA Insulation business with annual sales topping $8 million a year, serving multiple markets across Ohio. I consider myself fortunate to have seen USA Insulation evolve and am proud of the franchise system we have become. It’s great to partner with new franchise owners and see them grow their business and the USA Insulation brand. Learn more. We have prime territories still available in high-growth locations across the country, focused on cities like Milwaukee, Harrisburg, Kansas City, Detroit, St. Louis, Minneapolis, Oklahoma City, Virginia Beach, Newport Beach, Nashville, Denver, Tulsa, Des Moines, Birmingham, Little Rock, and more. Learn more. Take advantage of the benefits USA Insulation offers franchise owners! Hear what franchise owners have to say about USA Insulation franchising.